FULTON – Fulton City School District’s fifth annual Parent University served as a one-stop shop for academic, community and social highlights to further show local families the strength of a supportive, collaborative culture. Fulton City School District technology integration coach Brad DePoint talks with children about all the science, technology, engineering, art and math opportunities available through the district’s new STEAM program during the 5th annual Parent University at the Fulton Junior High School. Held recently at the Fulton Junior High School, the day-long event attracted dozens of attendees to breakfast, supervised children’s activities, a student art showcase, musical performances, prizes, lunch, a community resource fair and four sessions for parents or guardians and families. Geri Geitner, FCSD Director of Student Support Services, said the event served as the perfect conduit for school-to-home information and assistance. Sessions included a slime-making distance learning videoconference with a museum in Michigan, an informational component on teen dating violence, how to better support a child with nightly homework, mindfulness, Lego robotics, board of education roundtable discussion, the dangers of vaping, make-and-take meal, choices and consequences of impairment, school safety, understanding human trafficking, helping children find their story, how to stretch food dollars, fire safety, accessing health care, acceptance and the G. Ray Bodley High School Pride Club, understanding individualized education programs and flying drones. Michelle Briggs, coordinator of the district’s $1 million Title IV Student Support Academic Enrichment Grant, said Parent University served as the perfect opportunity for FCSD to show off all the technology materials and learning opportunities available through the STEAM after-school program for Fulton students in grades four to six. 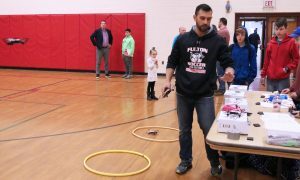 With guidance, children were able to program drones and watch them fly in the gymnasium. Throughout the day, children and their families were engaged in hands-on learning, which Geitner said Is exactly what the district aimed for with Parent University. The community resource fair, supported by dozens of community agencies and the Fulton Community School, also helped bridge families to both new and needed services to help keep children well enough to attend school each day.